In the past though, people were much more likely to head from north to south. The appointment of Matteo Salvini, leader of the far-right Lega party, as Italy’s new interior minister, has already lead to a showdown on migration in the Mediterranean. For the first time, Italy refused to let a boat carrying migrants rescued at sea dock at its ports, amid an increasingly bitter stalemate over migration policy within the European Union. Similar standoffs have continued with two other boats. The racist rhetoric that has found fertile ground in a public debate about migration in Europe tends to centre around two flawed assumptions: that migration is a new phenomenon; and that the Mediterranean has been historically “divided”, with people moving from the poor southern shores to those of the prosperous north. Migration is central to the history of the Mediterranean and there is a rich tradition of contact between its two shores. In the early modern era, between roughly the 16th and 18th centuries, mobility was intense and varied, in a similar way to today. In this early modern period it was mostly people from Europe who went to Africa and the Middle East in search of a better life or to escape religious persecution. This trend increased in the 19th century. From the 1830s on, impoverished peasants, from Spain, Malta, Italy, and France, migrated en masse to North Africa. Italian migration reached its peak in the first decades of the 20th century with an average of 12,770 emigrants a year. Many of those who crossed the Mediterranean in the early modern era did so against their will, fleeing wars, or political or religion persecution. The most dramatic case of what we would now call “religious refugees”, was the expulsion of thousands of Jews and Muslims from Spain in 1492. Expelled Jews resettled across Greece, the Italian states, North Africa and the Middle East, then ruled by the Ottoman sultans. All through the early modern period, the Jews moved south toward Ottoman domains in order to escape their frequent persecution in Europe. Another form of forced displacement was related to human trafficking. The ancient slave trade routes that crossed the area since antiquity granted the arrival of African slaves to Europe and Ottoman territories. Coastal inhabitants of Spain, North Africa, Italy and Palestine were also often captured during the frequent pirate raids and later sold as slaves. Ships and boats of various dimensions could easily become the prey of pirates and corsairs, which led many Englishmen, and Dutchmen to fall into chains. People also travelled across the Mediterranean out of their own choice. The area has always been characterised by a constant movement of soldiers, pilgrims, diplomats and travellers. Like today, men and women moved in search of a better life, but in the early modern period this movement was mostly directed from the northern to the southern shore of the Mediterranean. People from Europe used to move to the Ottoman Empire to seek their fortune, to evade justice or to improve their social prospects in a land that offered many opportunities to newcomers. Some of them found good fortune. Mediterranean history furnishes many examples of Italian, Englishmen, and people from other nations who obtained leading positions in the regencies of northern Africa and in Constantinople – modern-day Istanbul. Whatever the reason, moving to Ottoman territories did not necessarily imply the severance of personal ties. In 1591, a young woman from Venice, Beatrice Michiel, boarded a ship bound for Constantinople where she joined her brother, Gazanfer. Enslaved as a child and trained in the Ottoman court, he had become one of the Sultan’s trusted servants and scaled the Ottoman hierarchy. Over his 20-year stay in Constantinople, Gazanfer never lost touch with his mother and sister in Venice, who subsequently decided to join him. Letters from those who had permanently settled in Ottoman lands, ransomed slaves who returned home, merchants and travellers’ stories also contributed to the circulation of tales and ideas about the “neighbours”. Among the stories that circulated in 17th-century Venice, one of the most famous was that of Roxelana. She was a Christian slave girl, born in Rohatyn in current-day Ukraine, who became the wife of Süleyman the Magnificent with the name of Hürrem Sultan. These stories increased people’s curiosity and fuelled their wish to cross the sea. Goods, objects and food circulated too. Between the 16th and 18th centuries, European elites were fascinated by Turkish culture. Ottoman-style fashion inspired, music, architecture and artefacts. Regulations regarding the arrival of foreigners, border controls and policies of acceptance varied greatly across the Mediterranean in the early modern period. Authorities often showed a very practical approach. The Ottoman state welcomed Jewish refugees in the 15th and 16th century in order to take advantage of their technical competencies and trade networks. 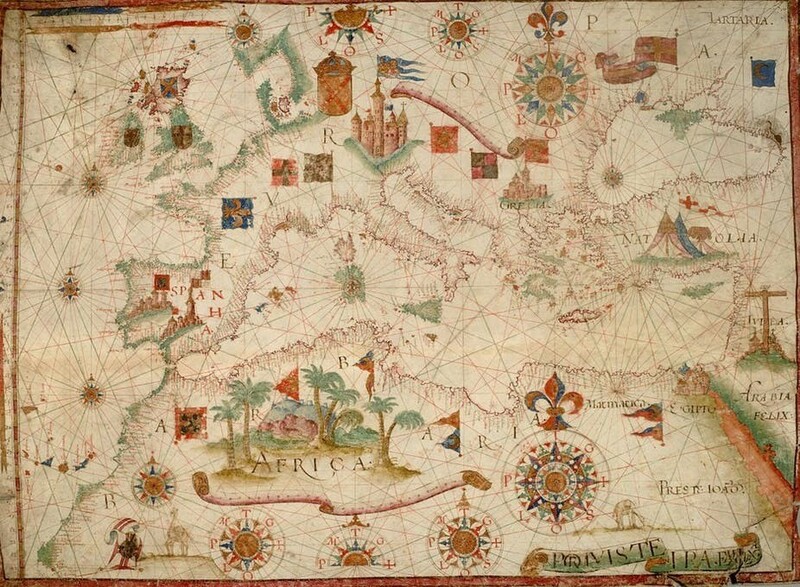 Image: Luis Texieira, Portolan Chart, Lisbon, ca. 1600 via Wikimedia Commons. At a time when 19th-century nation state ideology was yet to be born, factors such as religion, rather than than “citizenship” or origin sometimes played a greater role in the policy of acceptance. For example, during the Reformation, the Pope tried to restrict the arrival and stay of protestants within the papal state. In the Ottoman Empire, religious belonging also shaped the politics of integration as religious communities were in charge of offering assistance to newcomers of their own faith. This prevalence of migration from north to south across the Mediterranean continued up until the 20th century, when it began to shift in the other direction. A first flow of impoverished peasants from northern Africa to Europe, displaced by European colonisation, was followed after the wave of post-World War II independence by the return of those Europeans who had settled in colonies. Later, in the 1970s, the arrival of workers from the southern shore of the Mediterranean was encouraged by European governments in need of workers. The roots for this shift in direction of migratory flows are found in economic and political processes that started back in the 17th century, such as the growing influence of European power. This would go on to reshape the economic relationship between the two shores of the Mediterranean. It would eventually result in the transformation of the Middle East and North Africa during the centuries that followed into suppliers of raw material for French and British factories and pave the way for colonisation. All this shows that the direction of migration is not immutable – it is influenced instead by historical circumstance. It also lays bare the impact that processes such as colonisation had on migration patterns across the Mediterranean.